While cruising down the road through the burn I came across this chair. It was sitting quietly off to the side of the road in what had previously been a thicket. It was out of place in the middle of the forest. I don’t know for certain how it came to this place. Probably an old hunter left it behind. Someone who used it to sit comfortably for a long time in a place where he or she could watch for unsuspecting deer to cross the road. Why had they left it? Perhaps, it was simply forgotten, no longer useful, or maybe the hunter was successful and in all the excitement forgot to return for the chair. I think it had been here a long time. It sat there waiting for it’s hunter to return for season after disappointing season. This year, as the anticipation of deer season grew closer, something else came. Not the hunter. Instead it was the conflagration. For a few fiery minutes it became The Hot Seat. The fire roared passed leaving exposed the transformed steel skeletal remains of what was once the chair. Quietly, it still sits and waits. 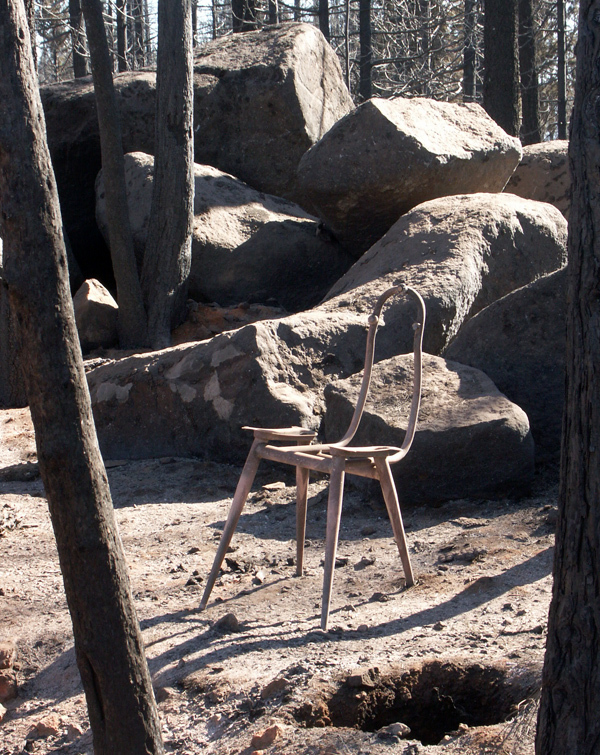 This entry was posted in Art In The Forest And Other Oddities, Forestry, Wildfire and tagged burn, chair, conflagration, deer, fire, hot seat, hunter by foresterartist. Bookmark the permalink. Thank you so much Valerie. That was very kind of you. I read your profile. Now that is an amazing story. I’ve enjoyed reading you posts, I like the insight into a life removed from the noise and concrete of cities and your pictures reflect this. I understand what you mean. In connecting with other bloggers I’m able to look through a window of a life quite different than mine, and often in a place far away. It is a pleasure when folks like you let us peek into your window. Thank you.